The chemistry major at Anderson University immerses students in the study of atoms and molecules, their composition and interactions. This study is recommended as preparation for graduate school, medical school, secondary-level teaching, or careers in government or industrial laboratories. It is a major included in our pre-professional health program. AU gave me the education I needed to pursue my dream of becoming a doctor. After graduating from AU with departmental honors in chemistry, Jacob completed the yearlong MBA program. He went to AT Still University for medical school. The chemistry major can be completed in a 3-year or 4-year track in the School of Science and Engineering. It is also recommended for physics or biology students to supplement and complement their major fields of study. 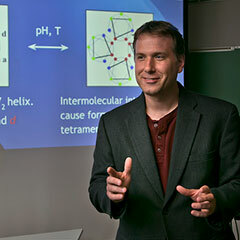 Students considering a chemistry major should begin their study with General Chemistry I. View the courses required for the Chemistry Major.